It seems someone is making 1080p mobile displays and quad-core S4 Pro processors like they're going out of style, as Pantech is now rumored to be working on a FullHD smartphone of its own. Everyone is keen to catch-up to HTC's DNA smartphone, which was unveiled last month as the first in what will likely be a new wave of smartphones with 1080p screens. With the likes of Samsung, Sony, and LG undoubtedly cooking up a response, several smaller manufacturers have also jumped in with impressive offerings of their own, including the Oppo Find 5 and ZTE Nubia Z5. Besides the 1080p display of unconfirmed diagonal (5 inch might be a good guess) and quad-core 1.5GHz Snapdragon S4 Pro processor, the Pantech Vega IM-A860 is expected to feature an Adreno 320 GPU and run on Android 4.1.1. No word yet on how much storage or RAM will be included, as well as what type of battery will power it all. The Vega IM-A860 is expected to hit retail in early 2013, likely as Pantech's next flagship smartphone. And the Note3 will eat Optimus G2 for breakfast. 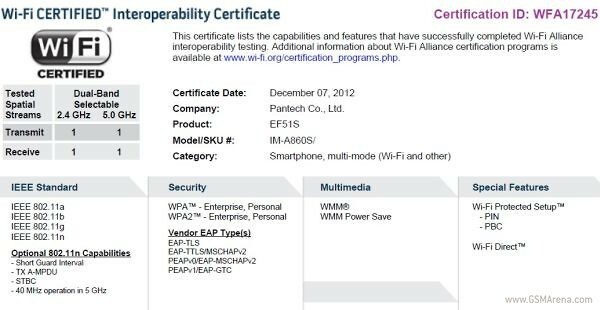 Pantech makes some really good phones with rather impressive specs. Sure they might be not as well known as the big boys out there, but they make up for it in performance.